To be the master of our imaginations or in other words to be in control of your thoughts is simple as well as complicated. Simple because it completely depends upon us and no one else. Yet it is so difficult to keep our thoughts in control thereby resulting in complicated situation. 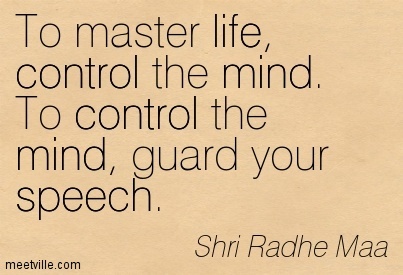 However, to have a happy and satisfying life, we have to master the art of keeping our mind in control. Neither over jeopardizing the situation nor underestimating it will help. Perfect attitude is to not react instead handling the situation. In case, the situation demands to react, react in a way after due consideration that the impact of your reaction is not negative. In order to achieve this, the basic requirement is to keep your mind under control. 1) Healthy Imagination: First and foremost is to master our imagining capabilities. Human being is the only creation in the universe who has a capacity to imagine the things in all area of life. Healthy imagination will help in positive perspective and prepare you to have your mind in control. 2) Be focused: It is difficult to know the purpose of life and to move towards it. Practically speaking, most of us are unaware of why we are here and our purpose in life. In this scenario, our suggestion is to take one thing at a time and involve all your energy towards it. Once you are focused to that thing, you automatically distance yourself from the negativity thereby having a control on your thought process. 3) Be your emotional friend: Our life quality depends upon our emotions. If we are emotionally drained, there are higher chances of having the depressed life. On the other hand, when we are emotionally charged up, we enjoy every bit of our life. The aloofness is the only reason to make human emotionally weak. Instead, of searching a friend outside, be your own friend first. This will gear up your emotional sense and thereby helps in controlling our mind. 4) Concentrate on body signals: Our body gives us the signal before even our mind reacts on the circumstances we face. Take for an example, if you come near to any dangerous place, before even you think what to do next, your body will react and signal you to run from that situation. If we are able to hear our body's call well in time, there are higher chances to be saved from such danger situations. Our body tends to give such signals to us at the regular time intervals. It is up to us if we observe them and make use of it constructively. 5) Be Positive: Anything that is disturbing and develop negative differentiation, avoid that by all your force. Positive in life is basically to have control on your thoughts in constructive way. To achieve this abstain from all sorts of negative thoughts; avoid making use of negative wordings, keep away from unsatisfied people. 7) Make use of affirmations: Either words can take control of you, or you take control of words. It is necessary to be mindful of what kind of words we use. Usage of words in affirmation leaves positivity on our mind and hence become easy to have control over it. Right from the birth till this moment, our mind is controlled by the circumstances we live in and our circumstances depend upon what we think. Both are inter-dependent on each other. 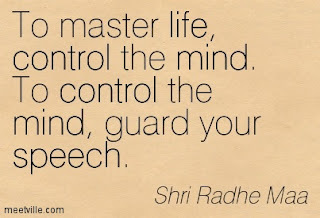 Hence in order to have a satisfying life, we have to concentrate on controlling our minds to live effective life.